So I decided to commemorate the LONGEST winter I can remember by making myself some striped slippers from an old, holey sweater. We're fortunate that our apartment is usually pretty toasty and warm, but this year even the biggest of my bulky socks aren't cutting it. Srsly, why is so damn cold? 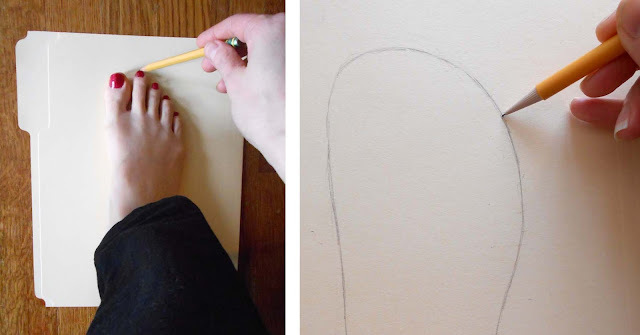 Step 1: Trace your foot onto a manilla folder. Clean up the shape till you like the way it looks. Step 2: Cleanly cut out. 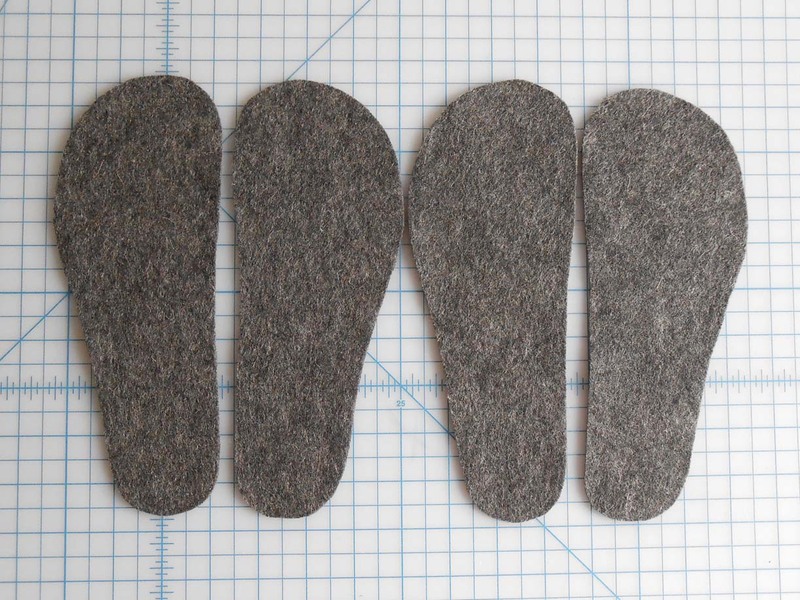 Step 3: Next trace the pattern onto your pieces of felt. 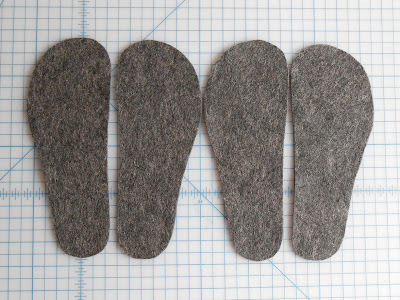 Trace the pattern twice per piece of felt, as we'll need two piece per slipper- one for the sole and one for the midsole. 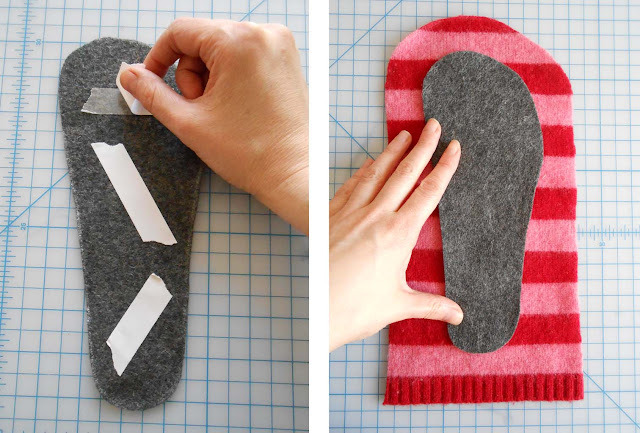 Flip the pattern over and repeat steps 4 and 5 for the other foot. Step 6: Use double stick tape to stick to stick the felt piece onto the sweater. Step 8: Place on your sewing machine with good side facing up and stitch all around. **This step can also be handstitched. I'd suggest using a contrast color embroidery thread, so that it will become part of the design. Step 1: Cut off each of the sleeves 5" from the bottom. Step 2: Stitch the sleeve opening shut. Step 3:Round the other end. When you've finished this, the plug will look like an egg with a flattened bottom. Now you have all the pieces and are ready to assemble the slipper! Step 1: Place the the plug over top of the foot bed with good sides together. The pointed area of the plug should be lined up with the center top of the foot bed. Tack stitch together at the point. Step 2: Pull the plug back 1" from where it would rest naturally and tack stitch the left and right corners onto that place. Step 3: Make two more tack stitches. One at the midpoint between the point and corners stitches on the right and then on the left. 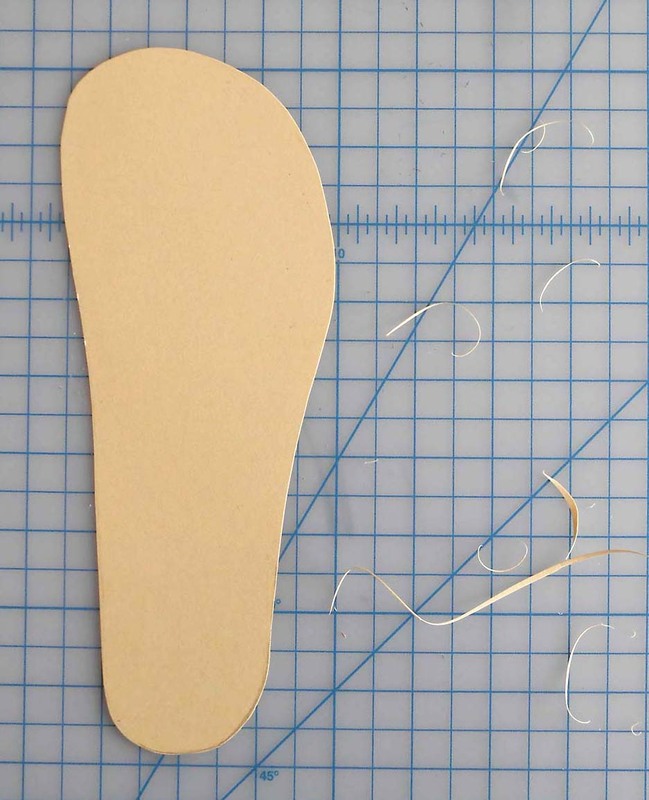 Step 5: Flip right side out, then make two snips on either side of the heel that go almost all the way to the felt. 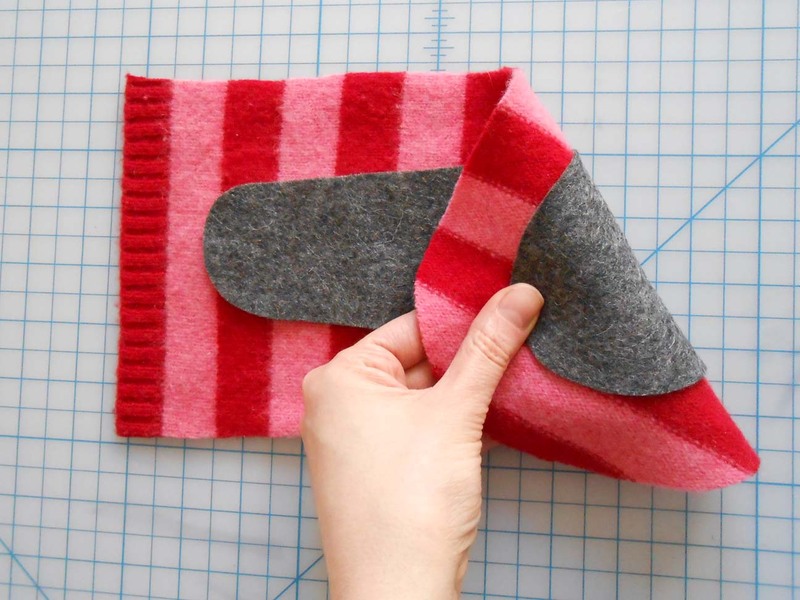 Step 6: Fold the two side pieces to form the back of the slipper. Insert the center flap into the slit at the bottom. Step 7: Close the back by running two rows of stitches up the back about an itch apart. Then sew straight across the bottom to close the slit. 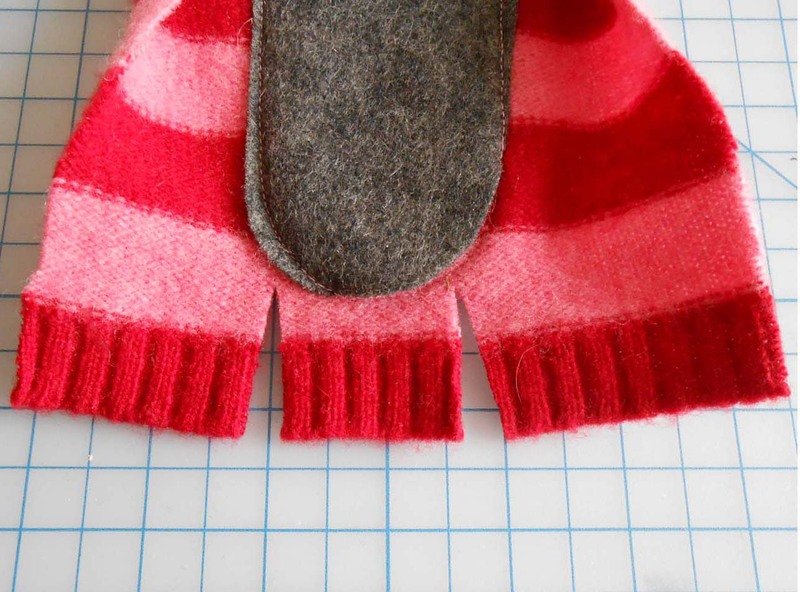 The last step in finishing the slipper is to add a collar. This will give the edges a clean finished look and keep the slipper from being so floppy. Step 1: Cut all around on the bottom of the sweater. Trim to about 2" high and cut in half. 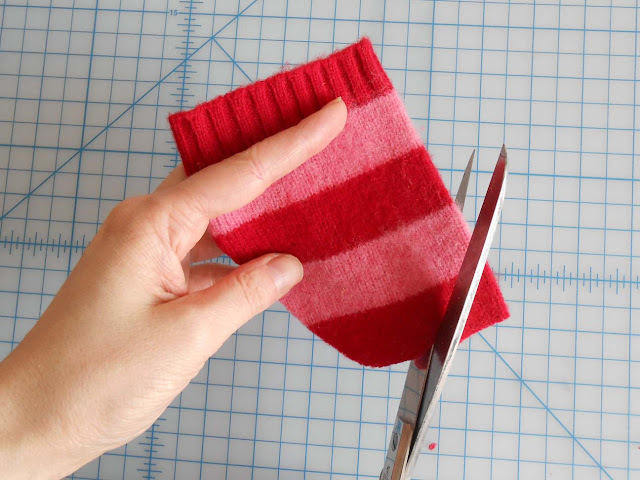 (If you can cut in half right on a side seam, even better. )Then put a little double stick tape on each piece. 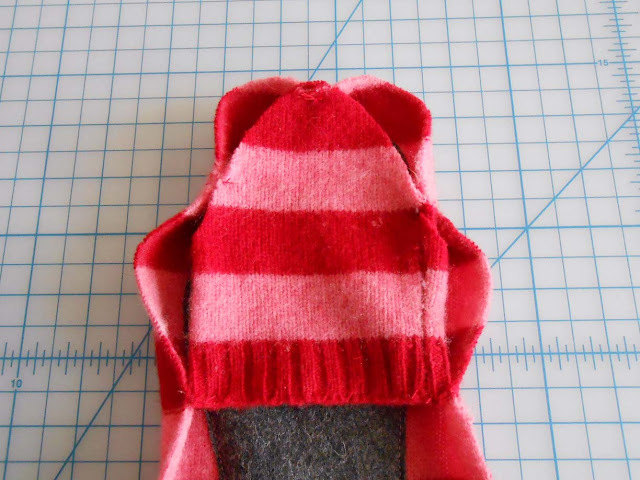 Step 2: Fold in half around the top edge of the slipper and tack stitch a few place to keep it from flipping up. And that's it, they're ready to wear! I was left with a good amount of extra sweater, which I've turned over to my kiddo, Ophelia. Ophelia is a wiz at making amazing stuffed animal from all things scrap.I look forward to updating this in the near future with what she created from the remnants. I know this thing how to prepare shoe. 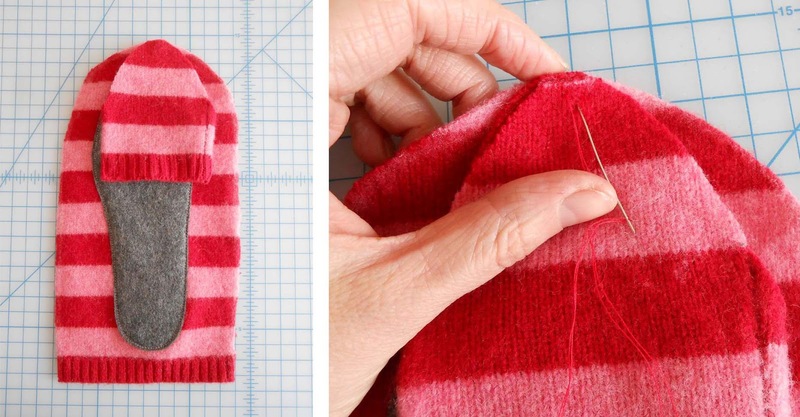 Great Idea, I have been saving felted wool sweaters to find some use for them and this is terrific! Congratulations for your home shoes and especially for explanations. It will be easy to make them! ...and to think; I was just making "scrunchie cuffs" for my ankle boots from wool sweater sleeves! Lol. These are adorable! May give it a whirl.. your directions are concise! Add some Grip-Tight Jiffy Grip fabric to bottom piece of felt before attaching and you're all set. Great tutorial, thank you so much! I think I will try to make a pair over the next few days. 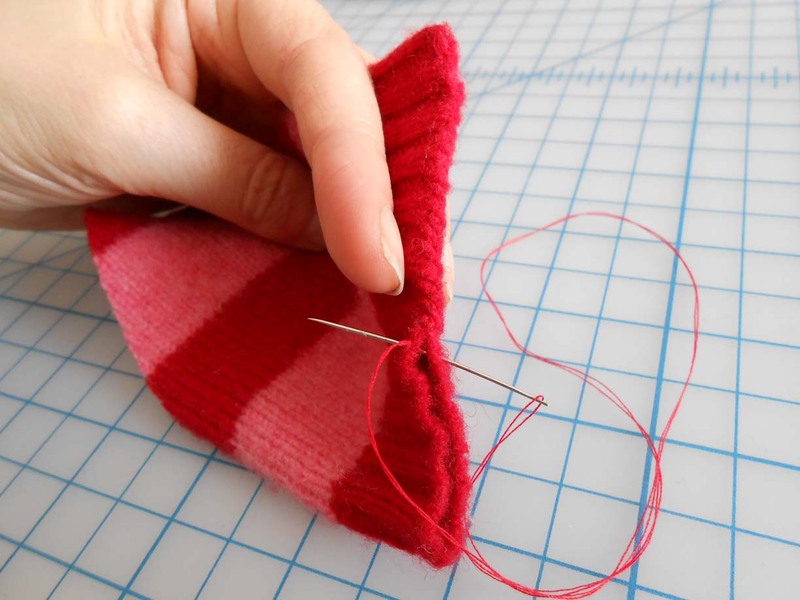 I have one question, and I am probably just dense: In "Adding a Collar" Step 1, you say to cut all around the bottom of the sweater. 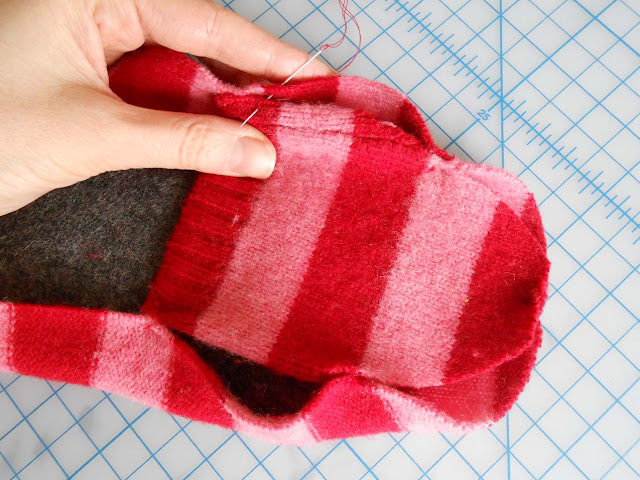 But I thought that the bottom of the sweater was already cut into/cut up during "Creating a Footbed" Step 5 part? How was there enough sweater at the bottom to cut up? I hope that makes sense. I am scared to start and make a mistake that I won't be able to correct in the later stages of this project-I seem to do that to myself often. Thank you again! Hi! Happy to clarify that step. 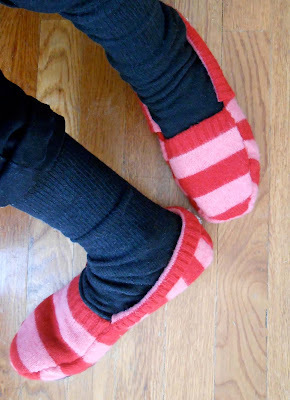 The footbed uses very little of the sweater bottom, so there should be more than enough for each of the steps. Don't be nervous, it's an easy project once you get going on it. I'm sure they'll look great. Fantastic idea! Thanks for the concise instructions...this should be a breeze! Clever girl! .... just had to throw in my 2 cents in that 2013/14 has GOT to be THE l-o-n-g-e-s-t winter EVER!!!! (tho last winter was bad this has been worse!) ... if there is One More Snow Storm, i think i shall faint!! ~chuckles~. 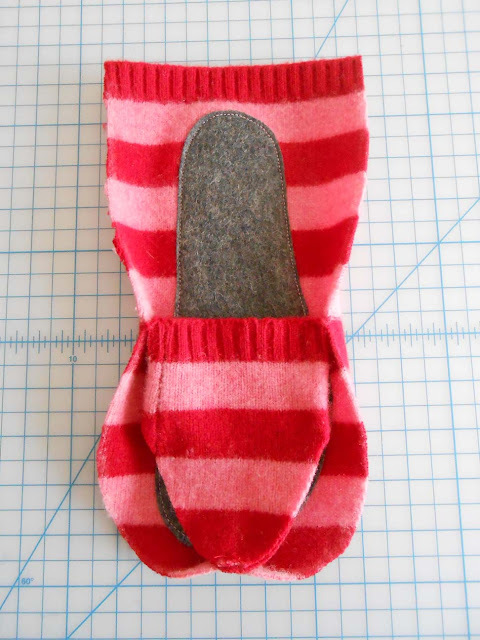 I found your precious slippers from Pinterest but it lead to lovethispic.com photo collage of your slipper construction and tho it was 'okay', i too sew, and needed a lil more clarification on construction so found your website! Am pinning this too! Wish i would have discovered these at the beginning of the season! 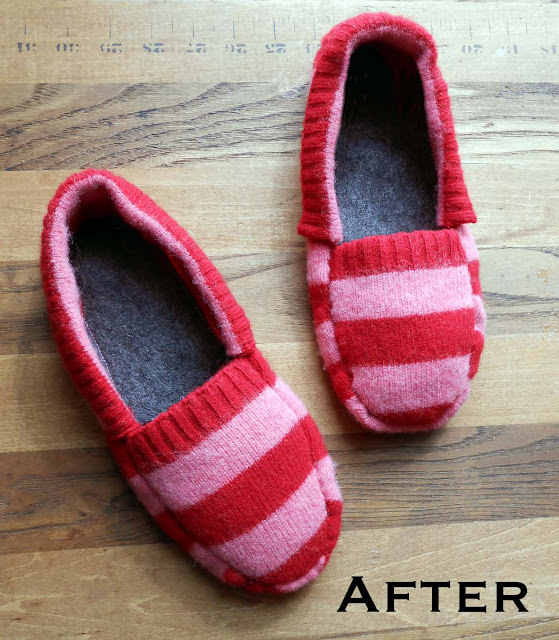 Have you ever taken puff paints (Tulip brand - carried in craft stores, discount stores, amazon, etc they come in an assortment of colours) and made designs on the bottoms of your slippers in order to make them slide proof for bare floors? Did this years ago on thick wooly socks my children wore when they were little. Have also added it to those cheap lil one size fits all gloves they sell in packs of 2-3 pairs on the palms for better gripping ability like the steering wheel and such. Now am going to look for what your daughter created from your scraps ! So happy that you like the tutorial! I think I have some of that paint, but haven't tried using it for traction. Sounds like a good idea, thanks for the suggestion! i love it. thank you very much. Brilliant! Then take some puffy paint and put some zig zags on the bottom and they are non stick too! Thanks for the post, I love them. Great tutorial! I need a new pair of slippers before this next winter - time to look for the right sweater. Thanks so much for sharing! What thickness for the felt ? Thank you! 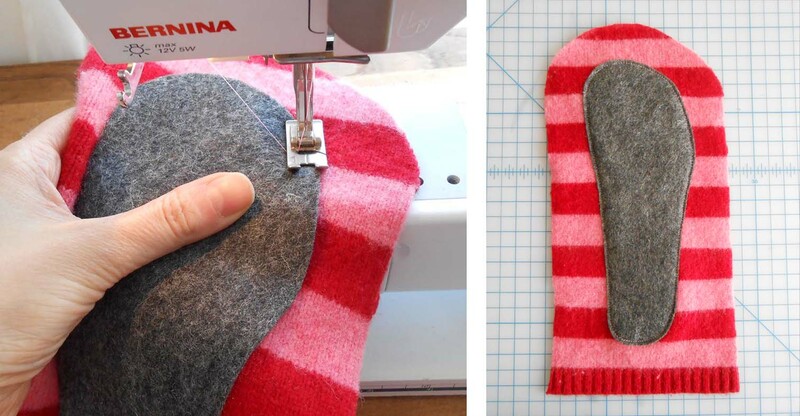 The thickness of the felt doesn't matter too much. It's definitely worth picking good quality though. Good luck with the project! Thanks for this idea! 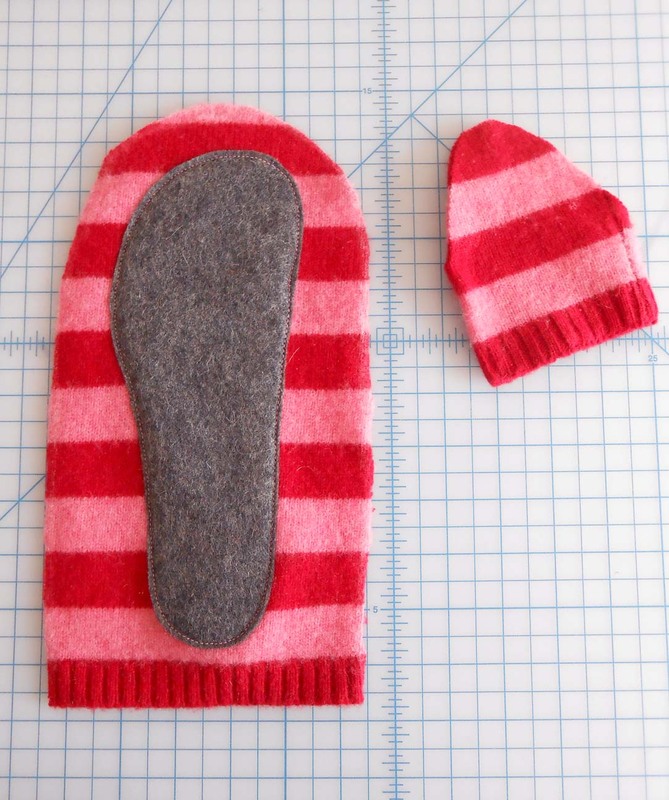 My daughter just asked me yesterday if I would make her and her boyfriend slippers...now, I am ready! Definitely my "to do" this afternoon after work! Love these slippers. Thanks for sharing the tutorial. 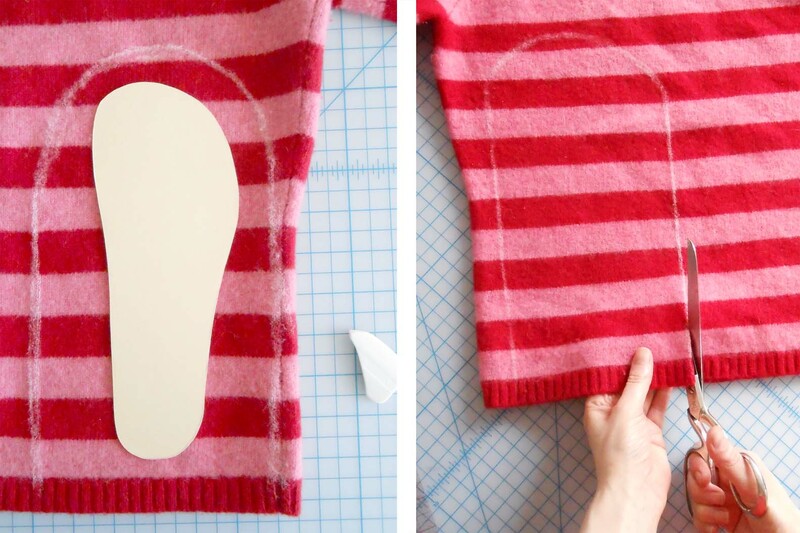 Have you ever tried a felted sweater? Would love your ideas. Love these! One question, when you put the collar on for the last step I see you use double stick tape. and you say to tack stitch in a couple places. How come you don't completely sew from end to end of the collar. Won't the collar come off since you only have it stuck on with double stick tape? 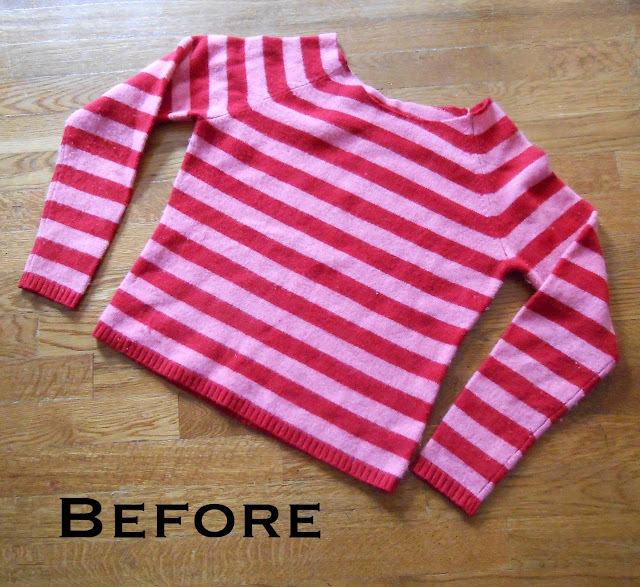 Out of all the patterns I have looked at regarding upcycling sweaters, this is the most hopeful! I know I will try this one. I need to wear clothes with natural fibers because my skin is sensitive. All I have to do now is find a sweater with 100% cotton or other natural fibers and I can begin! Thank you! Wow...so creative. The upcycled slippers look great. I really liked the step by step guidance on this article. 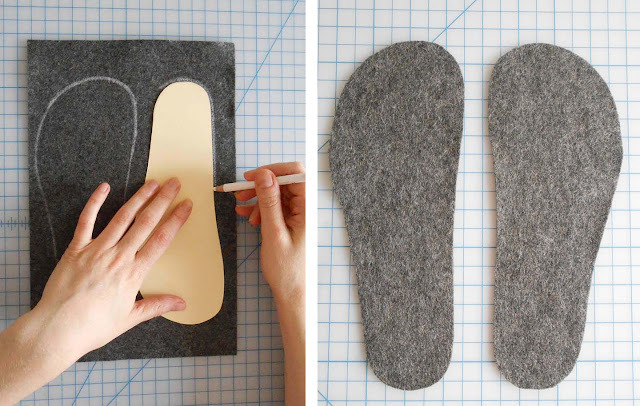 It looks really simple to make these slippers. Perhaps i will try when i have the time. My brother was just diagnosed with thyroid cancer. Fortunately, they caught it early and he is going in for surgery in a couple weeks. 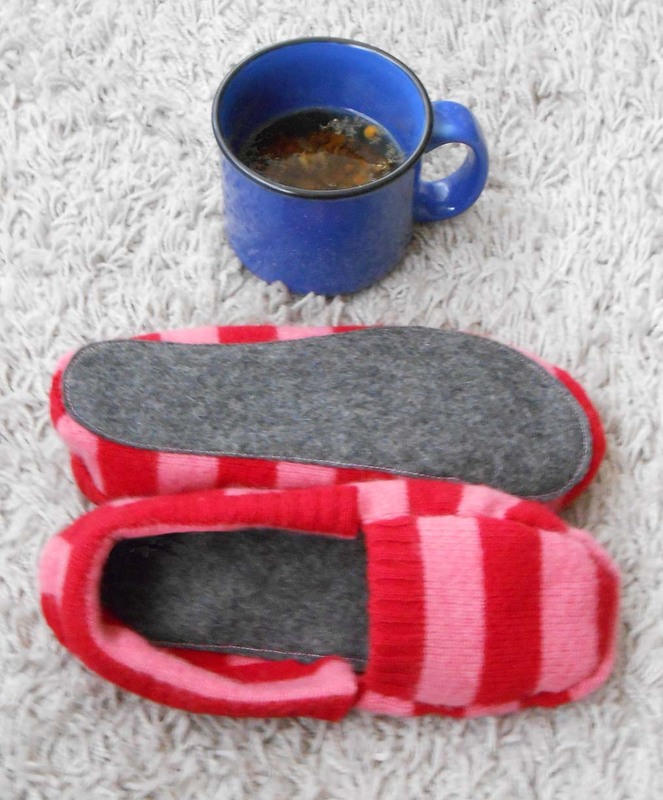 I am making him these slippers as a get well soon present. Thank you for the step by step, easy instructions! There is no felting involved here at all? 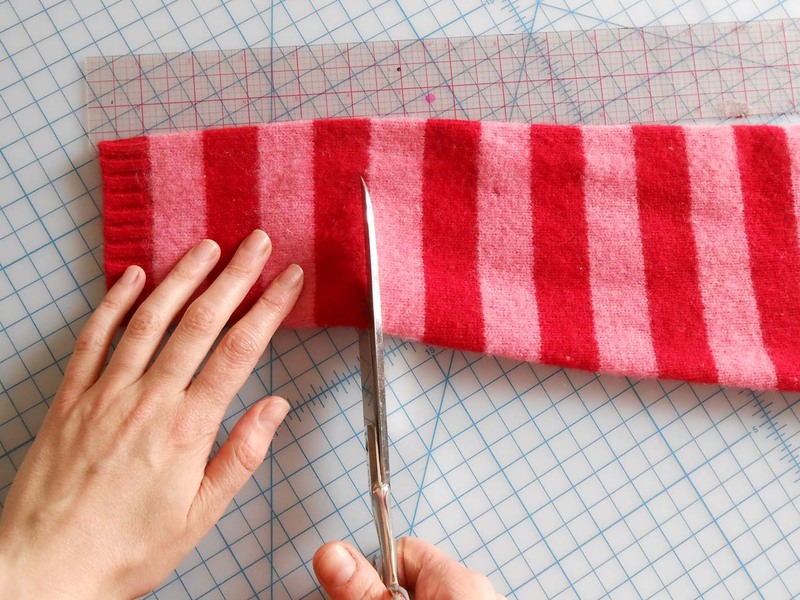 Just try to avoid making this with a flimsy sweater.